In case you didn't know, September is Blog Month at Compassion. There is a goal to have at least 3,108 children sponsored this month through the internet. 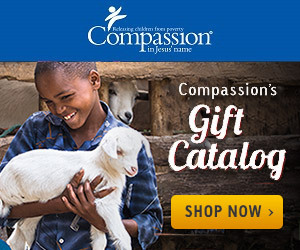 As of the e-mail we received this morning, 837 children have been sponsored because of Compassion Bloggers! Yay! Isn't this exciting! Little did I know how becoming a sponsor with Compassion would change my life, but You knew. To me, these children are not just a picture in a packet. They are living, breathing human beings who deserve a chance to make a difference in their little corner of the world. Thank You for moving in our hearts to add to our family in this way! Never before have we spent so much time praying for people we have never even met. However, we feel like these children are a part of our family, and they are. They are our brothers and sisters in Christ, and we love each one of them. We know You love them too, and You planned for them to be a part of our lives. If it is Your will, Lord, I pray that You continue to watch over these children, protect them, give them a hunger to know more about You, and help them to make a difference in their families and in their communities. Thank You for always being there to hear our prayers for these children. How about you? Have you ever written a letter to God about your Compassion kids?